If you are aiming to large target of clients most probably your website will need to offer your clients the option for the language they are browsing your Store on to be changed. With the default installation of your Store, PrestaShop will install a single language which you have chosen. In this tutorial we will show how you should import additional languages to your Store which will allow your clients to choose between the available languages for client convenience of course. First of all you will need the language pack import package. It is quite easy to get it via the official website of the application. There you will be able to download the concrete additional language pack you would like to import. The file is gzip type of archive and once you have downloaded it you are ready to proceed with its installation. Now that you have downloaded the language pack you would like to install (import) the downloaded language pack. It is quite an easy task and you will need to login as administrator in your Store’s backend and to navigate to Localization > Translations. 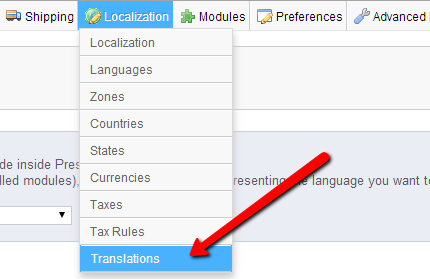 Once you land on the translations home page you will need to locate the “Import a language pack manually” interface which is the place where the magic happen. By simply clicking on the Choose file button and pointing your already downloaded gzip translation archive you will be almost done. The second field in this interface is called “Select your theme” and it is exactly to select the theme you would like the translation package installed for. Note that if you have more than one theme you will be presented with a list where all of the themes will be automatically selected. Once you press the import button your language will be successfully imported and it will automatically appear in the list of supported languages on frontend of your Store. Congratulations! You have successfully installed a new Language!